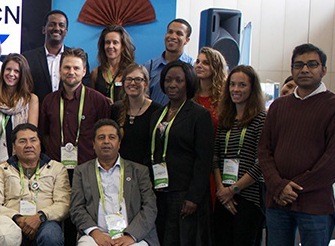 The year 2014 has been a momentous one for conservation and indigenous peoples alike. John Scott, Senior Programming Officer for Traditional Knowledge and focal point for Indigenous Peoples and Communities for the Convention on Biological Diversity (CBD) noted that many significant decisions have been made in the past several weeks: “We can now use the term ‘indigenous peoples and local communities’ in major policies. It has taken 22 years to get to this point.” Scott noted that the acknowledgement of the term is a real sign of respect, but “we must remind governments about their commitments, especially to maintain the already agreed upon standards." Leonardo Rosario pointed out that policies crafted at the international level are oftentimes not brought to the communities, so they are not aware of these policies and their rights. Dias agreed and said that accessibility for local communities needs improvement. He cited Brazil is commendable example. 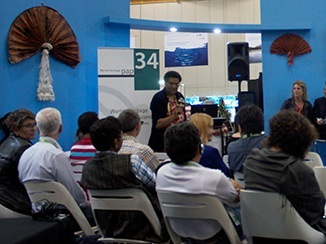 Lucy Mulenkei from the Indigenous Information Network (IIN) in Kenya said that “COP 12 was quite a success for indigenous peoples involvement, especially as they play a large role as stakeholders.” She felt that more inclusive involvement has been promoted, but biodiversity issues must also be at the forefront. Tui Shortland of the Nga Tirairaka o Ngati Hine from New Zealand criticized poor reporting on the Aichi Biodiversity Targets, especially on Target 18 on respecting traditional and customary knowledge. She underscored the importance of preserving linguistic and cultural diversity as these are significant carrier of customary knowledge. 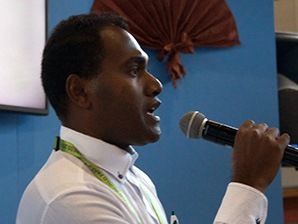 Samson Viulu, co-chair of the Pacific caucus of the WIN reported that the Pacific Caucus was established at UNSIDS. Reflecting on the experience from his own country, the Solomon Islands, he said that “we lack proper capacity to set up NBSAPs, so it’s important for indigenous peoples to attend conferences and workshops.” He expressed his hope that indigenous representatives from the Pacific would get involved in the WIN Pacific Caucus to continue to develop protocols suited to the Pacific area. The responsible governance of tenure can increase food and nutrition security and help protect the environment. Food and nutrition security depend on how people access land, fisheries, and forests. Access is often not consistently and responsibly regulated; whereby it is possible to have legal framework or unwritten customs and practices. The session explored how the responsible governance of tenure can provide protection against arbitrary loss of tenure rights experienced by local and indigenous communities, and therefore contribute to food security. Francesca Romano from the Land Tenure Team at FAO introduced the voluntary guidelines as a way to provide responsible governance. They were developed using a cross-sectoral approach: “Land, forestries, fisheries are touched, and they are water-related in a broad sense”. The guidelines are a legal document urging governments to recognize tenure rights and the people who hold them, safeguard them and prevent disputes and violent conflicts arising from unclear tenure arrangements. 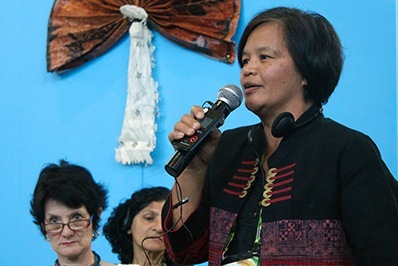 She pointed out that the guidelines are an instrument for all, not just for governments, but also available to civil society organizations, indigenous peoples and local communities and the private sector. She called on civil society to check on governments regarding their implementation. 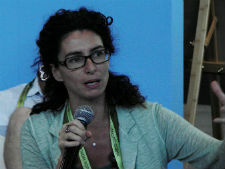 Lena Westlund from FAO explained that the guidelines were developed following a rights-based approach. She explained the relevance of the voluntary status of the guidelines: “The voluntary guidelines do carry certain weight, even though they are voluntary, because they have been agreed on by member states.” She highlighted that the challenge is to implement the guidelines. The key to this will be awareness raising among stakeholders and governments, for the guidelines to make a difference in the lives of people. Joe Martin from the Tla-o-qui-aht First Nations in Canada explained how teachings lived on in their people. Eli Enns, North America Coordinator for the ICCA Consortium, complemented by pointing out how the social contract is embodied in the traditions of the Tla-o-qui-aht. After a recent court victory, his indigenous group realized that “we have an important governance responsibility here”. The guidelines could be a way to help reclaim this governance responsibility. Naseegh Jaffer from the World Forum Fisher People (WFFP) in South Africa presented on impacts of the small scale voluntary guidelines. He explained that they “give formal recognition to the small scale sector as a sector. You are not just a stinky man stepping off a boat anymore.” He warned that implementation of the guidelines won’t be an automatism: “The guidelines are not going to be handed out on a platter. They will come to us through campaigns on the local and national levels.” Continued engagement from civil society is crucial. Mikaela Jade of Paramodic introduced the significance of data in today’s world: “Data will be the new oil, start getting yours now.” A particularly new innovation is wearable technologies like Google Glass, a device containing more than 50 different sensors and data tracking devices. Jade encouraged the audience to try to understand what types of data are being collected, by whom, and how indigenous peoples and local communities can retain ownership over the data collected. From her own experience, she shared that in the process of creating a new app, she collected data without having an understanding of where the data was stored. As an example, were Google Glass used in indigenous lands, secret sacred sites could be revealed through the technology, since GPS positions are constantly tracked through Glass. This is a threat to cultural integrity. 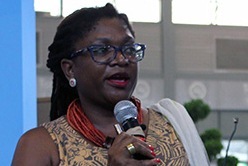 An implication of this is that when data is produced, communities have to ensure that they will own this information, so they are not left out when benefits are created: “We must ensure digital sovereignty of communities.” Jade suggested data management plans as tools to ensure ownership. Community elders should be able to decide whether they are comfortable using the device, and if they are not, it should not be used. Where does the data go to, including where is it stored physically? How does the community get it resolved back in a valuable and valid way? In the case of Google, the information created is owned by Google, without ownership of the community. However, sights and cultural rituals are oftentimes sacred and secret in aboriginal communities. This is under threat if the information gets distributed worldwide by a third party. Additionally, cultural knowledge may be devaluated if it has been digitized. WIN Dialogue: Extractive Industries and Indigenous Peoples and Local Communities - Can We Negotiate? Masego Madzwamuse from the Open Society Initiative for Southern Africa moderated the session, a reflection on how traditional land owners worldwide can confront the encroachment on their territories by extractive industries. She highlighted that this this is an issue faced by countless indigenous peoples on all continents, and welcomed the speakers. Florence Daguitan from the Tebtebba Foundation in the Philippines presented on how her people have responded to extractive industries. 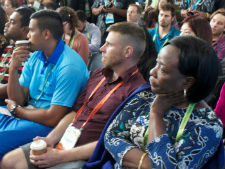 Her insights showed that fighting extractive industries will produce a mix of failures and successes for indigenous peoples. Back in the 1970s, a logging concession of 200 ha in indigenous territories was protested with respect and dignity despite martial law. A degree of self-determination was won in the 1980s, but in 1995 the Philippine Mining Act gave de facto ownership over natural resources to foreign corporations. Ms. Daguitan pointed out that unity is needed among indigenous peoples: “We need to fight united against corporate mining.” Additionally, indigenous peoples themselves need look after their territories better: “If we destroy our own lands slowly, we are not going to make progress.” Despite these challenges, Ms. Daguitan noted that awareness about corporate mining is now higher than before among indigenous peoples and local communities in the Philippines. 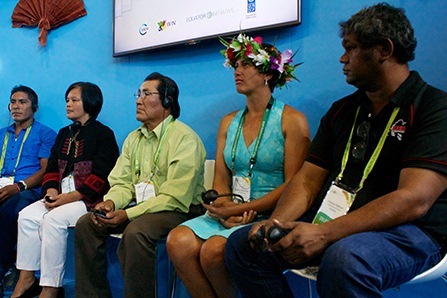 From the Cook Islands, Teina Mackenzie of Te Ipukarea Society gave an overview over her community’s efforts to counter deep seabed mining. Even though the government has committed to create a marine park that would extend over roughly half the size of the Cook Islands’ EEZ (an area of 1.8 million sq km), there are negotiations about granting concessions to corporations to exploit the rich natural resources in the Cook Islands offshore Exclusive Economic Zone (EEZ). This conflicts with the communities needs, since the sea is the main source of livelihoods for community members. Seabed mining could lead to a collapse of the ecosystem, given that the waters the communities rely on are already subject to many stressors beyond their control, such as the effects of climate change. Ms. Mackenzie pointed out that “when discussing conservation measures, there will always be the concern that economic development would lag if plans for resource exploitation were aborted”. Her community is fighting for strong regulative measures to ensure that when mining is carried out one day, it follows the highest environmental standards: “When we move into that industry, we will be prepared!”. She reported that she feels fortunate that many Cook Islanders are already aware of the risks of mining the ocean. 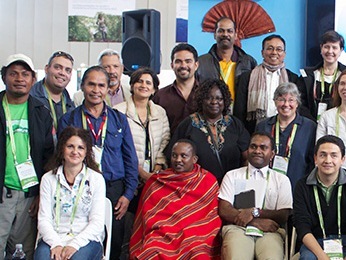 Clemente Caimany from the Consejo Regional Tsimané Mosetene in Bolivia presented the experience of his organization, which represents 22 indigenous communities in the Pilón Lajas Biosphere reserve. The council was awarded the Equator Prize 2010. While the organization was able to lobby for a protected area in 1992, a variety of threats on the reserve persist, such as plans for mining, logging, oil exploitation, or the construction of a dam. With roads come colonists, too. The government had even planned to re-settle the communities to other places. To counter these pressures, Mr. Caimany’s organization developed a toolbox, consisting of guides and activities to monitor impacts of outside economic activities such as mining or hydropower. Creating this data gives communities a much better starting point in negotiations. Mr. Caimany stressed that such negotiations are necessary: “You can’t work against the government, or it will get much worse.” Instead, a collaborative approach, bringing in stakeholders, communities and NGOs is needed. Willis Ombai from the Open Society Foundation of Southern Africa (OSISA) introduced the prospects for fracking in the Kalahari desert in Namibia. This technology, using large amounts of water to pressure natural gas out of porous rocks, is a major threat to local communities and indigenous peoples inhabiting the lands with the resources. Mr. Ombai showed a video depicting the case. He explained that OSISA’s film created a national debate about fracking in the Kalahari.